This entry was posted on December 6, 2017 by Jessica Anderson. Personalize A Gift To Remember! Holiday shopping has begun and it's time to think about what to get your clients, vendors, and your staff to thank them for their service to your company over the past year. The important thing is to tailor your gifts to your recipient. The more personal in nature you can make them the better. Your customers are the reason you're in business, you want to thank them for their patronage over the past year. For a smaller client, a holiday card and small gift might be enough. But for a key client, you want to appreciate them with something special, below are some ideas. Edible gifts - it can be something like a fruit basket, box of special candies or even steaks. Special dinner - either treat your client to a dinner out or a gift card to your client's favorite restaurant. Wine Boxes: include a favorite bottle of wine and place it in a personalized wine box with your logo on the top. A perfect way to present a special gift to remember. Cooking Tools: For a more casual office, engrave a BBQ tool set for their use all season long. Also engraved cutting boards make popular and functional gifts. Without key vendor relationships, your business would not run smoothly and efficiently. Thank them for helping you grow your sales with a custom gift. Polar Camel Cups - These cute and affordable personalized tumblers are a very practical gift, engrave their name or company on the side to make it personal. Treat them to a coffee card inside as well. Business Card Holder - with their name and logo, they will think of you daily! Engraved Coaster Set - another tool they can use on their desk to remember your relationship. 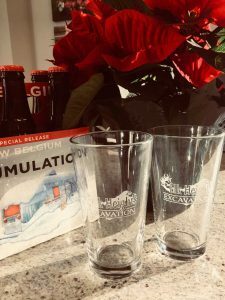 Engraved pint glasses paired with a special brew make a great gift! 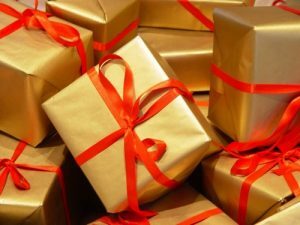 Treat your employees to a party and gifts to show your appreciation. Without your staff, you would not be able to do what you do! Bonus: All employees like cash as a thank-you for their hard work. That would be the first step for a gift. Beer Gifts: I just had a customer order 48 engraved pint glasses for her team of guys with the company logo etched on the glasses. I told her to add craft beer with the glasses for a gift they will love! Wine Gifts: In the same genre as the beer, monogrammed wine glasses make fantastic gifts for your staff. Include a nice bottle of wine for another lovely gift that will be enjoyed for many nights to come! Games: For the office jokester, consider a fun personalized game. The mini corn hole game can be a great break in the office and we also offer personalized poker sets. Golf Gifts: Maybe you have golfers in your office, consider an engraved golf ball box with a dozen high quality balls inside! We also offer a putter gift set, perfect for an office and our popular Hole-In-One Plaque to memorialize an epic round! Don't Forget About Promotional Products! We now offer a huge catalog of items for your business including pens, notepads, lanyards, give aways. Check out our new Promo Products Website and see the thousands of the options. Put some thought into how to show appreciation to important people in your business! Personalization makes it special, it's key to a meaningful gift. Happy Holidays!